Botanical Name: Plantago lanceolata L.
Other names: English plantain, narrow-leaved plantain, rib-grass, ribwort, black-jacks. Buckhorn plantain is widespread throughout the United States and Canada. Buckhorn plantain is a perennial broadleaf. It reproduces by seed, or new shoots formed at the base of the plant. It flowers throughout the summer and seedlings emerge in the spring or autumn. Buckhorn plantain is a weed of turfgrass, nursery crops, landscapes and other crops. It is common on drier soils with basic to neutral pH. Buckhorn plantain forms a rosette of leaves with parallel venation. The leaves are long, narrow, and ribbed. Mature plants may have several rosettes arising from the basal crown. The roots are fibrous and arise from a thick, short, taproot-like underground stem. The flowers form on the ends of leafless tall stalks. The flowers are contained in dense cone-like spikes which mature from the bottom up. The individual flowers are inconspicuous and form seeds which are brownish, shiny and become sticky when wet, aiding in animal transport. Buckhorn plantain spreads by seed and by new shoots produced at the base of the plant. Elimination of flowering plants before seed dispersal will deter spread although mowing alone may not prevent seed formation on some plants. Buckhorn plantain can be hand weeded but the short fleshy tap root must be dug out to prevent re-growth. Buckhorn plantain is most common on sandy dry soils, although it can grow in dense lawns with moist rich soil. 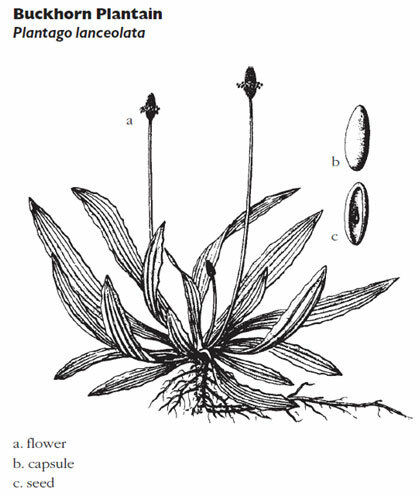 Since buckhorn plantain seeds can germinate in the dark and plants can become established in dense vegetation, hand weeding of small infestations may be necessary to supplement vigorous turf conditions. Buckhorn plantain can be chemically controlled with several broadleaf herbicides. Products that are two- and three-way combinations of broadleaf herbicides are particularly effective. The best control can be achieved when buckhorn plantain is actively growing. The turf area should not be mowed for two to three days before and after herbicide application. The treatment application should be done at a time when there is no rainfall expected for at least 12 hours. For a details on current herbicides registered for buckhorn plantain control, refer to the latest edition of the Professional Guide for IPM in Turf for Massachusetts.